New member Mabel Bodell, MD, giving her classification talk at today's meeting. Our youngest Rotarian, Cam's baby son Jack. Gil Sparks with the Wenatchee Downtown Club. Paul and Linda, Andrea's parents. Luis, a guest of Braden's. Kris Cameron, a guest of Dom's. Brandt Gulick, a guest of Rob's. David Kazimba had a happy buck because it's the first day of school! Ron Brown also had a buck for that, and another for the Wine and Food Awards which took place this past weekend (watch a video recap here) as well as a buck for his daughter in college. Cam had a buck in thanks for old baseball buddies, with whom he recently had a 20-year reunion. Rob had a sad buck in support for a member who recently lost a loved one in law enforcement. Andrea's dad Paul had a happy buck for her joining our club, and said her grandfather (also a Rotarian) is very proud. Bob Bullis had a happy buck because he got to meet up with an old boot camp buddy from the Marines recently and spent some time catching up. Mike Williams had a happy buck for the light at the end of the tunnel that we're beginning to see when it comes to this smoky fire season. Ivan had a happy buck because he recently got to take a lovely road trip up into Canada and back. From Patrick Bodell: Our outbound exchange student Treat is settling in in Japan, and it was our inbound student Alina's first day of high school at WHS today. Gil Sparks wants to invite everyone to the all club meeting on Sept. 13 at Pybus Public Market, where we'll be hearing from Dr. Jeff Jones of UW medicine. Lunch is provided by Cafe Columbia and is $10, please let Rob know if you want to RSVP. From Lindsay Bentsen: Our Sept. 26 meeting will be an evening social at Andrea's house in East Wenatchee. Please email Andrea or/and Lindsay to RSVP and to get directions. Also go to our Facebook page for more info about that event. Our private club pickleball lessons will be taking place on Oct. 13 from 11-1. Please let Lindsay know if you'll be there. From President Richard: Please join us Oct. 24 for the all-club polio dinner. From Rob: Please sign up to serve concessions at the Battle of the Bridges EHS vs WHS high school football game on Nov. 2 at the Apple Bowl. Your last chance to volunteer to help out at the Gorge is this weekend during the Dave Matthews Band weekend. Please contact Rob if you can help out. We are extremely lucky to have Dr. Mabel Bodell join our club recently and today she gave her classification talk. It was an interesting mix of her family and educational history and it was as fascinating as it was inspirational. I do believe our cumulative GPA, as it were, as a club went up considerably on the day she joined. We'll post her slideshow to the blog later for those of you who missed the meeting. Multimedia and copy by Dominick Bonny, vice president. Wenatchee Confluence Rotary Welcomes Our First Exchange Student! About 15 members of the Wenatchee Confluence Rotary club gathered Tuesday, Aug. 21 at Pangborn Memorial Airport to welcome the club’s first international exchange student, Alina Heikkurinen. Heikkurinen, 17, is from Riihimäki, a small town located in the south of Finland, about 42 miles north of Helsinki. After a long trip, she said she was pleasantly surprised such a reception. It was her big sister that gave her the inspiration to apply for the program. Patrick Bodell, youth exchange officer for Wenatchee Confluence Rotary, organized the welcoming committee and he and his wife Mabel will open their home to Heikkurinen, serving as her first host family. Bodell said part of the reason he feels so strongly about Rotary exchange is because he has benefitted from the program too. 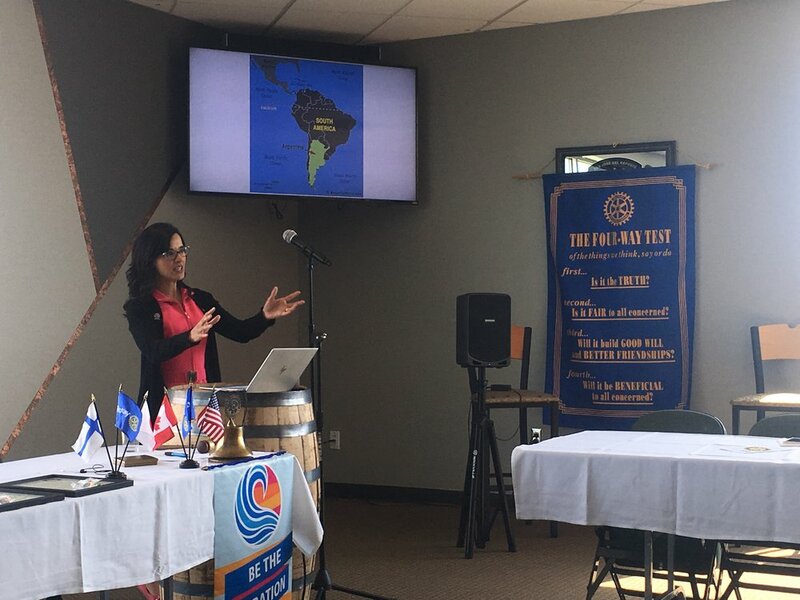 Heikkurinen is one of three international students in the area being hosted by Rotary clubs. Each student will attend high school and live with a total of three host families during the course of their exchanges. To learn more about Rotary Youth Exchange in general, visit rotary.org, and to learn about what other projects Wenatchee Confluence Rotary leads, visit wenatcheeconfluencerotary.com. Photos and copy by Dominick Bonny, vice president, Wenatchee Confluence Rotary. Attending: Linda Adamson, Katie Atkinson, Kellen Parton, Kevin Vitulli, Patrick Bodell, Cam De Mestre, Dominick Bonny, Kathryn Bonny, Lindsay Bentsen. Meeting called to order at 12:19 p.m.
Treasurer's report: All outstanding bills are paid and there's about $10k left in the Wenatchee North Rotary account. None of the funds from WNR can transfer to Rotary Club of Wenatchee Confluence. Thus, president Richard proposed we give $3k of those funds to Rotary Park maintenance. Dom made the motion, it was seconded by Kevin and passed unanimously. The second motion was also made by Dom, to cover the cost of Rotary event abroad for the most recent Allen Landis Scholarship recipient, Treat Schubert, as he studies abroad in Japan, we well as give additional funds to StoveTeam International. It was seconded by Kevin and passed unanimously. President Richard suggested we give the remaining $3k to the Rotary International Foundation, split evenly among the members moving over to Confluence Rotary so those funds will be counted toward their Paul Harris Fellowships (after all remaining bills have been taken care of). The motion to move remaining club funds to the RI Foundation was made by Kevin, and seconded by Patrick. The motion passed unanimously. Then President Richard requested authorization to officially dissolve the Wenatchee North Rotary Club. The motion was made by Kevin and seconded by Lindsey. It was passed unanimously. Wenatchee North Rotary was dissolved at 12:55 p.m. and the board of the Rotary Club of Wenatchee Confluence commenced its first board meeting. Those notes will be on the website soon and will be published by the new club secretary Carl Polson. Today marks our last official meeting as Wenatchee North Rotary! We had 27 members and visitors present, including Kyle Vierck, the new AD at Wenatchee Valley College, Davis Halle, Treat Schubert, Giogio Casiroli. Bryan Campbell was our visiting Rotarian. On August 8 Sherry Chamberlain presenting our new club charter. It will be an evening meeting/party and Bealinda would like folks to volunteer to help plan the details. So please contact her at this email address if you'd like to help. August 9 is the all-rotary club picnic at Sunrise Circle. Greg Franz is thankful for new athletic director at the college, he's officially retired as of Monday. Bob Bullis announced that not only is Franz retiring, but he's also going to start going to the gym with him. Patrick Bodell is excited about World Cup Soccer, and we would expect no less from our resident Rotary exchange coordinator. Brian Campbell is proud to announce his brother is retiring from the Chelan PUD and his son is graduating as a Navy Seal. Congratulations to both of them! The Mission: GranDuro is this weekend and they could use snacks if you can donate any. Don't forget about the "Red, White and Brew" Beer Garden we'll be hosting at Walla Walla Point Park on July 4! The Facebook event is up, the press release is out and our co-hosts at the Chamber of Commerce have been getting the word out as well as selling tickets. In fact, Shiloh gave it a plug at Business After Hours at Apple Valley Honda this evening. The rest of the meeting was simply a work session, we had no program or guest speaker. Thank you to Kathryn Bonny for taking notes. 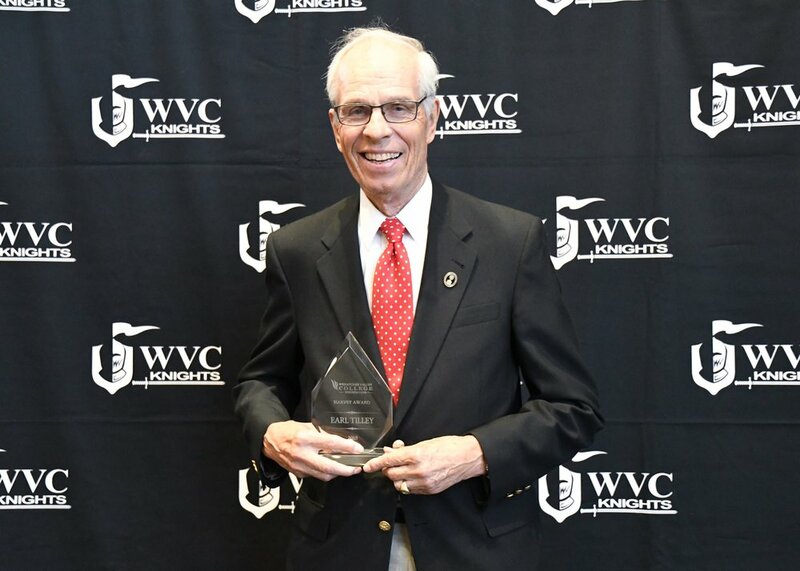 Congratulations to club member Earl Tilly, who was presented with the Harvey Award at the Wenatchee Valley College Foundation Gala on Saturday, May 19, 2018. Watch this short video featuring Earl that was screened at the gala. 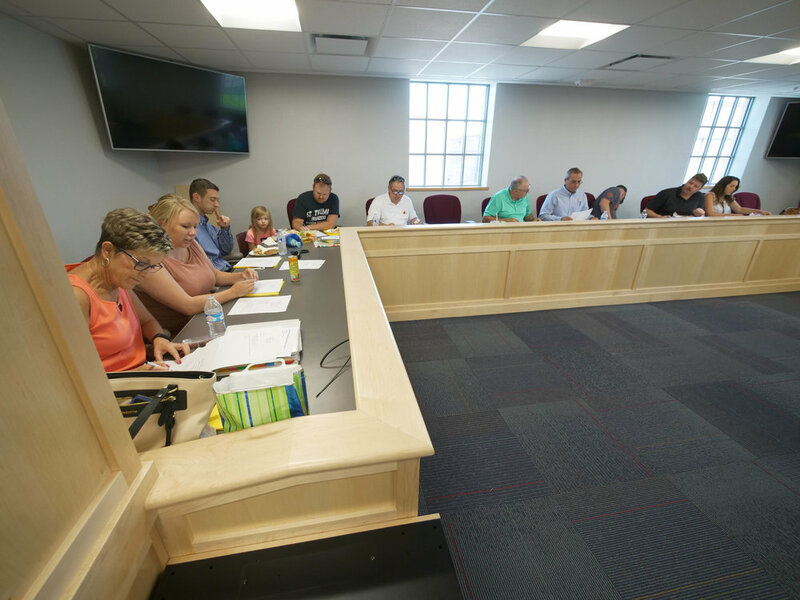 18 Members attended today's meeting. Rob Tidd – His brother is here! Steve Tidd – Tax season is over, son Logan is home for the summer. Richard De Rock – last weekend spent in Prosser for the District Conference, our new club application has been submitted, 39 of 50 members voted to belong to the new club, and has been officially nominated as the 1920-21 District Governor Conference (may not be correct verbiage) will be here May 14-16, 2021. Andrea Johnson gave her classification talk today. Check back on the blog later for her notes from that introduction, as well as more information about what she does for a living as well as for fun! Even Plews gave a presentation about the Mission GrandDuro, which is June 30. This is a club fundraiser in part and they are seeking volunteers for aid stations. Learn more about the event by visiting the GranDuro website, and let Evan know if you can volunteer by emailing him. The 50/50 Raffle winner was Ivan Christensen. He took home $17.